Ticket Division introduces Instant Funding for all event organizers who wish to receive payments as soon as tickets are sold. As cash flow can be crucial to event organizers who face scheduled payments for production, artist fees, promotion and marketing expenditures, Ticket Division released a new payment method that allows event organizers to get paid as soon as you make a sale. No more waiting for a settlement until the end of the event, Instant Funding connects to the event organizer\'s Stripe® account and funds get transferred instantly. In an industry led for a long time by PayPal®, Ticket Division decided to partner with Stripe® to process instant payments as the younger payment processor has surpassed the historic company with comprehensive payment options and services in favor of individuals and businesses. One of the most distinctive features is the absence of fund holding. Money is transferred directly to the owner's bank account while PayPal® can hold funds and allow limited ACH transfers that may take several business days to post. To set up instant funding on your account, simply go to your company profile page when logged in as an administrator of your organization and select Instant Funding as your preferred method of payment. 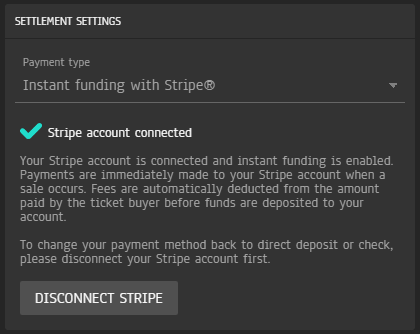 Select "Connect with Stripe" and you will be redirected to stripe.com to authorize Ticket Division to transfer money to your account. If you do not have a Stripe account, you will be invited to create one.